Crash Bandicoot. Jak and Daxter. Those names alone would make furry fans lift their ears and take notice. But Naughty Dog Studios (even their name is furry!) have created other well-known games over their 30 year history too, including Uncharted and The Last of Us. 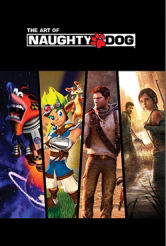 Now Dark Horse Press have put together The Art of Naughty Dog as part of Naughty Dog’s 30 year multimedia event. From Gametrailers.com: “‘It will span the history of Naughty Dog and feature hand-picked and never before released artwork depicting our past, present, and future,’ Naughty Dog’s Eric Monacelli said. ‘Being around for thirty years has bestowed upon us all kinds of incredible art from our amazing fans. Select fan art will be a chapter of the book as well. To mark the occasion properly we’re having a book launch event later in the year.’” More precisely, this hardcover book will be on sale the 1st of October.